This front porch is accented with an arched gable and tapered columns frame each side. Inside, the kitchen is positioned for front views with a window over the sink. A walk-in pantry, bar with sink, spacious utility room with side entry porch, and abundant storage will appeal to the modern homeowner. The dining room and master bedroom open to a grand screened porch with skylights and a fireplace. 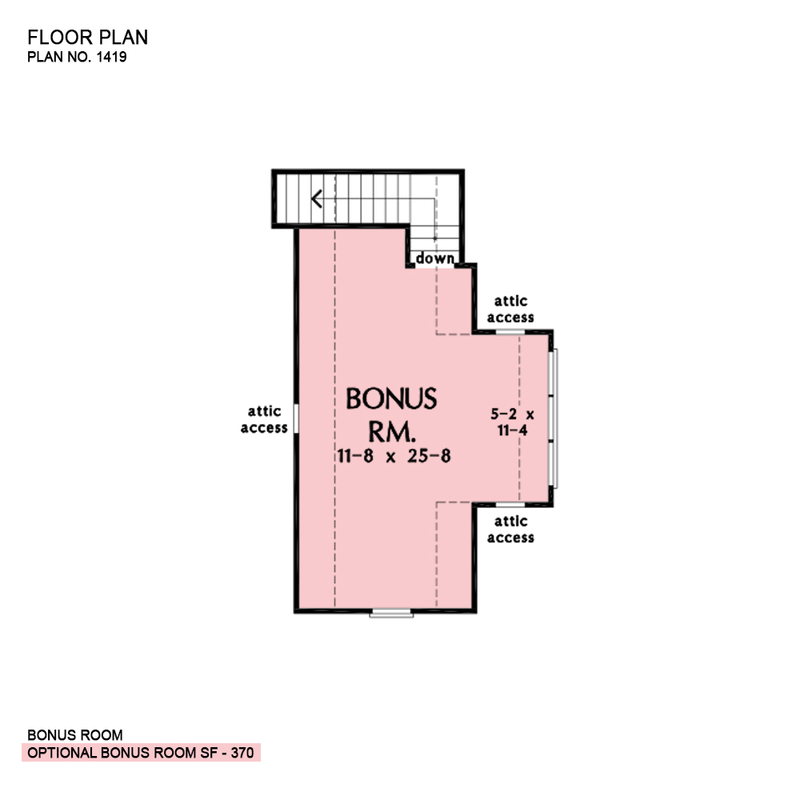 Bonus Room: 370 Sq. Ft.
Porch - Front: 292 Sq. Ft.
Porch - Right: 48 Sq. 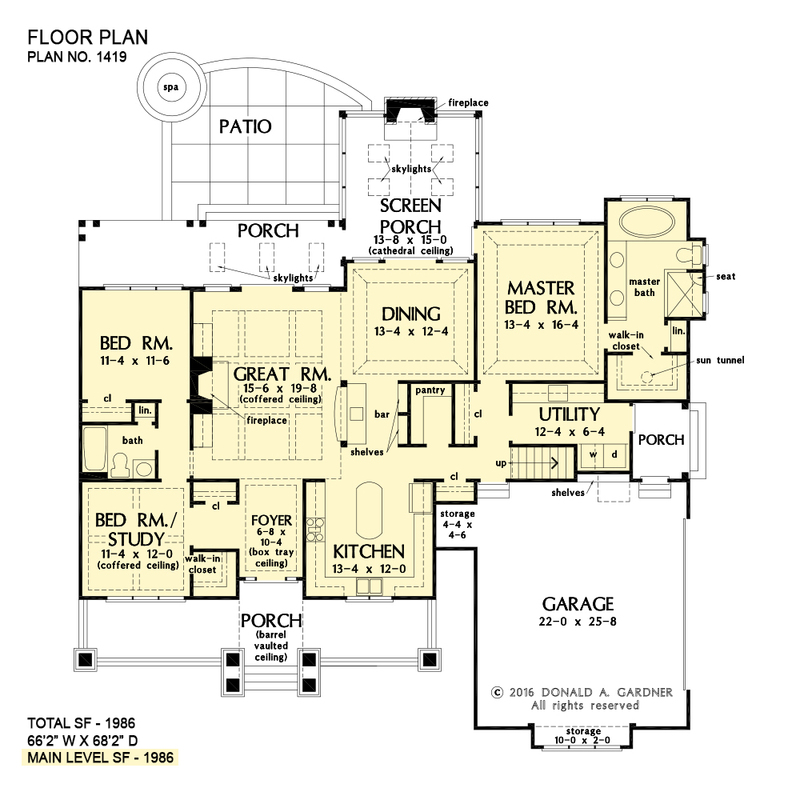 Ft.
Porch - Rear: 193 Sq. Ft.
Porch - Screened: 237 Sq. 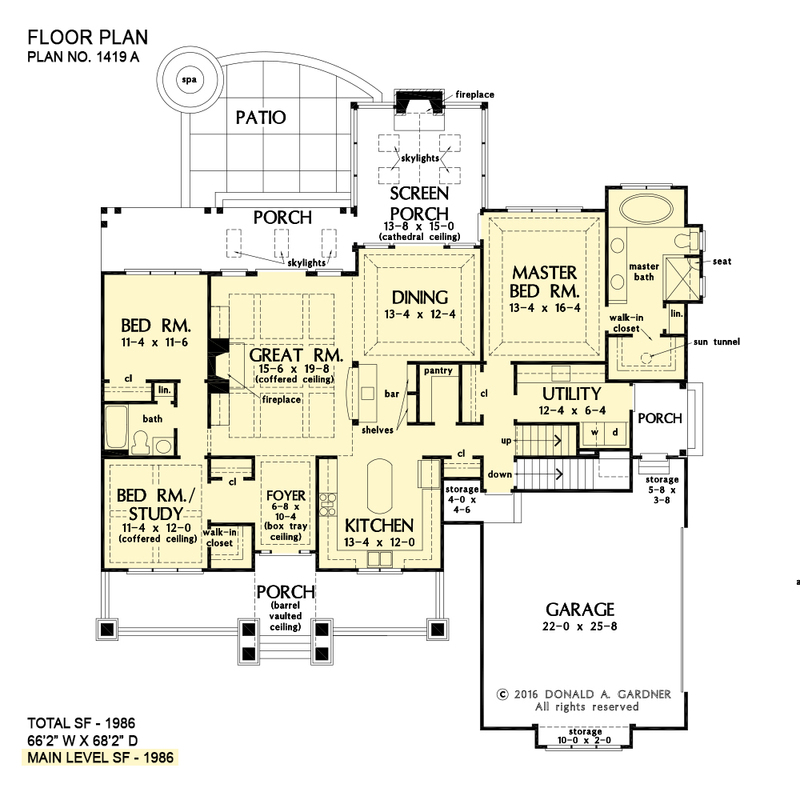 Ft.
House Dimensions: 66' 2" x 68' 2"
Great Room: 15' 6" x 19' 8"
Wet Bar (Flat): 6' 8" x 6' 4" x 9' 0"
Garage Storage Bay (Flat): 10' 0" x 2' 0" x 0' 0"
Foyer (Tray): 6' 8" x 10' 4" x 10' 0"
Dining Room (Tray): 13' 4" x 12' 4" x 10' 6"
Great Room (Coffered): 15' 6" x 19' 8" x 11' 0"
Kitchen (Flat): 13' 4" x 12' 0" x 9' 0"
Utility Room (Clipped): 12' 4" x 6' 4" x 9' 0"
Bonus Room (Clipped): 11' 8" x 25' 8" x 8' 0"
Garage (Flat): 22' 0" x 25' 8" x 0' 0"
Garage Storage (Flat): 4' 4" x 4' 6" x 0' 0"
Bedroom / Study (Coffered): 11' 4" x 12' 0" x 10' 0"
Bedroom #3 (Flat): 11' 4" x 11' 6" x 9' 0"
Porch - Front (Flat): 37' 6" x 7' 0" x 9' 0"
Porch - Rear (Flat): 27' 10" x 7' 0" x 9' 0"
Porch - Right (Flat): 6' 0" x 8' 0" x 9' 0"
Deck / Patio (None): 18' 7" x 17' 0" x 0' 0"
Porch - Screen (Cathedral): 13' 8" x 15' 0" x 17' 2"